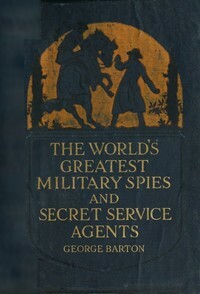 Download The World’s Greatest Military Spies and Secret Service Agents ebook. The romance of war in its most thrilling form is exemplified in this narrative of the adventures of The World’s Greatest Military Spies and Secret Service Agents. Much has been published upon the subject of espionage, and the memoirs and secret histories of the courts of Europe give us instances of men and women who have gained favor and money, if hot honor and glory, by selling back-stairs gossip concerning their fellow creatures; but the aim of the present work has been rather to relate the big exploits of those who faced great personal danger and risked their lives for the sake of flag and country. Each story is complete in itself, and yet forms a link in the chain of narratives which illustrates the startling and unexpected manner in which battles have been lost and won through the shrewdness and the courage of military spies at various time in different countries of the world. All spies are not admirable. The use of the word “spy” in this series is in its broadest, and usually its best, sense. In all of the great wars of history there have been spies, scouts, emissaries and others still with no very well defined status, who have rendered invaluable service to their governments. A spy is liable to death; a scout, if captured, has the rights of a prisoner of war, but an emissary is rather political than military, and is sent to influence secretly the opposition rather than to bring information concerning the movements of troops. An effort has been made to confine this work to the operations of military spies, but in possibly two instances the rule has been relaxed in order to present phases of that form of diplomacy which is so closely allied with war as to be part of it. Most of the incidents interwoven with the history of the countries to which they relate, and are part of the archives of the State, War and Navy Departments of these nations. Taken all in all, the pages of fiction contain few things more fascinating or thrilling than these fact stories. Nineteen biographical accounts …(1) The Alsatian Smuggler who Helped Napoleon …(2) Belle Boyd …(3) The Indian Scout who was the Hero of King Philip’s War …(4) How the Suicide of a Staff Officer Once Averted War between Austria and Russia …(5) Major André’s Unsuccessful Exploit …(6) Chevalier D’Eon …(7) Napoleon’s Chief Spy …(8) Lydia Darrah …(9) Doctor Steiber …(10) Private Morgan …(11) General Napper Tandy …(12) Monsieur de Meinau …(13) The Betrayal of Captain Nathan Hale …(14) Major Le Caron …(15) Emma Edmonds …(16) Brig. Gen. Lafayette C. Baker …(17) The Mysterious “F” …(18) The Mysterious Man Who Asked for a Light …(19) Carl Lody. All are historical accounts – not fiction.